I’ve decided to call this piece “Yes Two Can.” She is looking over “… the cowboy, the main Leo the Lion in her life. The black and white cat is also fondly admiring what she sees. The ballerina leaps through the air while the Motorman stares. He has his arms out directing traffic. The spa like pool in the background has a door and wall that separates the scene from the outside world. On the right side of my main figure (me) I have a frog diving down after a fish and a frog sitting on a rock looking back into the past. A white horse is galloping into the future. There are two fabulous blue and yellow Macaws chatting and looking at the garden woman holding two tiny birds. The trees surround her and the snake is moving forward. Don’t ya just love the garden Woman? I find the figure lovely. On the upper left side is the bather who is toweling off as she also looks at the scene below. As I put together the collage I thought about the differences between the woman and the cowboy. Her with the emerald and diamond earrings and him with leather work gloves and chaps. Her in the spa, him out doors. Behind him is a black and gray floor. 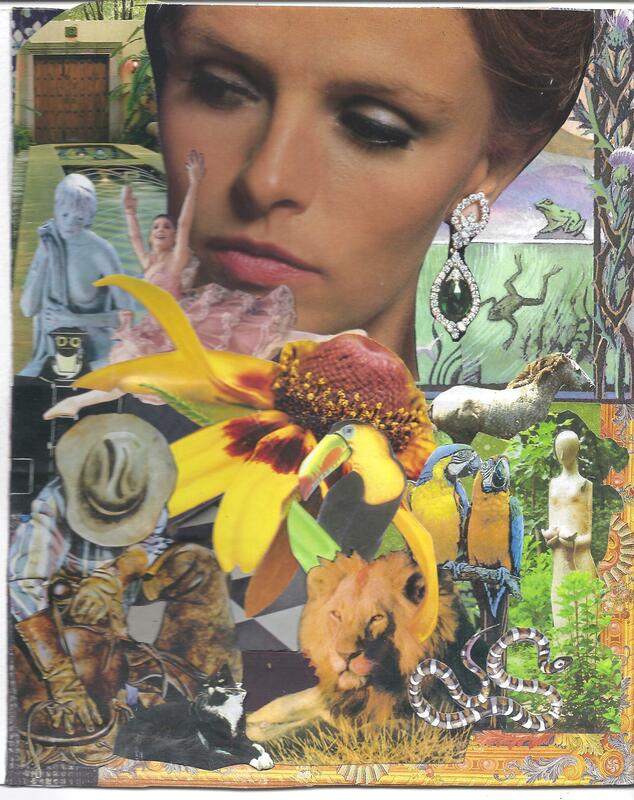 The bright yellow daisy is at the center of the collage. The flower is fully open its petals flung back its center open to the sun. When I found the image of the Toucan I had to get him in the collage somewhere. He is sitting on the lion’s neck. The yellow petals around him. I heard myself say … Yes! 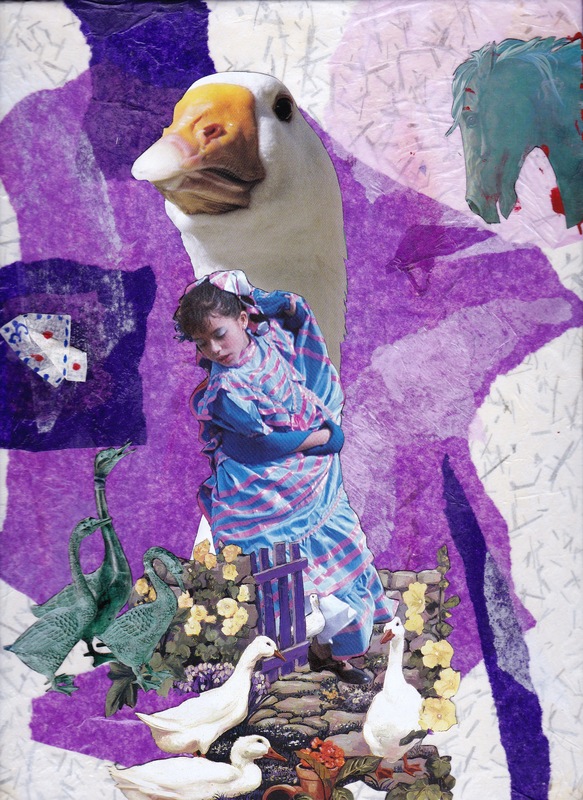 Two can.” As I look around the collage piece I see several two’s … two cats, two Macaws, two frogs, two men, even two thistles. Life is better with two. I enjoyed creating this collage. It was fun, joyful and informative. I’d be interested in feedback especially if there is anything that jumps out that I missed. I plan to approach the collage work spontaneously, without a preconceived idea. Once the piece is finished I’d like to ask “What has this collage got to tell me that I don’t already know?” If I asked the question “Can two different personalities be happy together … The collage is saying Yes they can, as shown in the combination of the Toucan and Lion. Out of the 8 images Chris sent me I used 5 and sent back three. 1 image I cut up and used only parts. I enlarged a few images and shrink some of the others. My first “Oh yes image was the yellow daisy. I also loved the frogs and the snake. In the Chinese zodiac I was born in the year of the snake. I also loved the thistle on the boarder of the card which I included. I like the idea of being spontaneous and intuitive. Spontaneity is a perfect word to work with in this new challenge. As a child, one of my favorite stories was The Goose Girl. Gruesome as it may seem, the character I loved best and remember most clearly is the faithful horse Falada, whose head gets chopped off. Even in death he remaines a faithful helpmeet. Of course, Falada was a magical horse and the magic was always my favorite part. I also liked stories with blood in them. I think there may be arcane bits of knowledge we’re born with or are privy to through the collective unconscious. Or maybe, the deep knowledge of blood mysteries is part of a woman’s heritage, encoded in her DNA from birth. The magic associated with blood runs like a red thread through fairy tales and myth. In The Goose Girl the mother pierces her finger and lets three drops of blood fall on a handkerchief which she gives to her departing daughter as a magic talisman. Then, there’s geese. Geese have always been great favorites of mine – possibly because I liked this story so much and read it so often. In ancient Egypt the goose was thought to have laid the primordial cosmic egg, but also to have hatched from it as the sun. Geb the Earth god was sometimes called The Great Cackler! (Egyptian mythology is terribly confusing – mostly because we don’t know enough and try to interpret things according to current cultural sensibilities.) In north Africa it is still (4,500 years later!) customary to sacrifice a solar goose at the solstice. 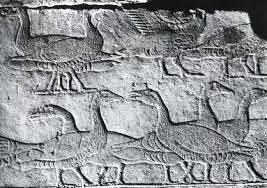 Obviously, geese represent return journeys and thus the “heroine/hero’s journey” of Campbell fame. The journey for the quest of self includes leaving home, descending into the dark, facing one’s demons and returning to the community with a treasure. The Goose Girl story follows this formula, taking our heroine through an initiation from childhood to adulthood. Like so many of these stories, this one served me well. The Goose Girl taught me to value courage, perseverance, and ingenuity. I wanted to make them my own. I didn’t realize how much she meant to me until years later, well into my fourth decade, I encountered a terracotta sculpture called Gaia Goose Girl. I wish I knew the name of the sculptress. Her goose girl was a near life-size figure of a lovely young woman with a face full of strength and character accompanied by a goose. Seeing it brought back every feeling of identification, love and longing I felt when first reading this tale. That kind of experience is what makes art so important. The art piece acts like a catalyst, constellating a host of amorphous feelings and associations in a way that captures both memory and significance, but at the same time, allows new insights to unfold. My sculptress is not the only one to find inspiration in the goose girl. 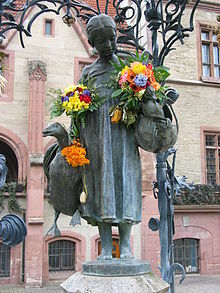 In Göttingen town, famous for its old university (Georgia Augusta, or “Georg-August-Universität”), which was founded in 1737 stands a decorative fountain whose main figure is called the Gänseliesel (Goose Girl). On the day they are awarded their doctorate degrees, students are drawn in handcarts from the Great Hall of the university to the Gänseliesel-Fountain in front of the Old Town Hall. There they have to climb the fountain and kiss the statue of the Gänseliesel. This practice is actually forbidden, but the law is not enforced. She is considered the most kissed girl in the world. The students remind me of Little Conrad (Kürdchen) in our story. Most interesting, in light of the conjunction of horse and geese in our story, is a report by Vasily Vasilievich Radlov that in the Altai mountains (mountain range in East-Central Asia, where Russia, China, Mongolia and Kazakhstan come together), after the ritual sacrifice of a horse, the shaman ascends on the back of a goose in pursuit of its soul. All the bits and pieces, hints and allegations are what truly fascinate me about these tales. This story has everything – wise elders, a nefarious villainess, a faithful spirit guide, a sacrifice, a mistaken identity, importunate young men, a charming prince, restoration and retribution, but other fairy tales are often thin on plot and sometimes appear simplistic on the surface. However, no matter how simple, the tale usually contains a detail or two rich in association and resonant with meaning. For me, it isn’t so much about deciphering that meaning as relishing its presence. It’s the ambiance of the stories that make them so endlessly fascinating. The grok is everything.